collectSPACE - news - "Anniversary of the first ALT free flight"
August 12, 2002 — Before the space shuttle could orbit in space, it had to prove that it could land on Earth. Twenty-five years ago on August 12, 1977, the first free flight by the prototype orbiter Enterprise was successfully flown at Dryden Flight Research Center at Edwards Air Force Base in Southern California's high desert. 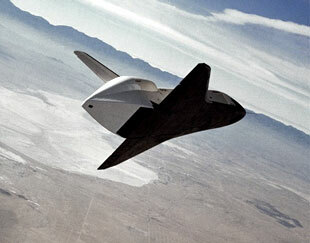 This was one of five glide flights conducted at Edwards as part of the Approach and Landing Test program, jointly managed by Johnson Space Center and Dryden. The Enterprise arrived at Dryden in January 1977 after a 38-mile overland journey from the Rockwell International's Space Division facility at Palmdale where it had been assembled. It then began a series of eight captive-carry flights -- five unmanned and three with crew aboard -- on the back of NASA 905, the modified Boeing 747 Shuttle Carrier Aircraft (SCA). These captive flights verified the aerodynamics and handling of the space shuttle and 747 combination, as well as orbiter systems, and cleared the way for the first free flight. As the sky began to brighten the morning of August 12, about 65,000 spectators were in attendance, as well as nearly 900 members of the press and about 2,000 special guests. On-board the Enterprise were astronauts Fred Haise and Gordon Fullerton, while the 747 SCA was flown by Dryden research pilots Fitz Fulton and Tom McMurtry and flight engineers Vic Horton and Skip Guidry, the latter from Johnson Space Center. At 8:00 a.m., Fulton ran the 747's engines up to full power, and the piggyback combination accelerated down runway 22 and lifted off into the summer sky. Accompanied by five T-38 chase planes, the 747 flew a racetrack pattern above the dry lakebed. The release was scheduled for 8:30 a.m. but high air temperatures slowed the climb to the release altitude. At 8:48 a.m., Fulton nosed the 747 SCA into a shallow dive, and Haise radioed "The Enterprise is set; thanks for the lift." Haise then pushed the separation button, firing seven explosive bolts. The Enterprise seemed to pop off the back of the 747. Fulton then put the 747 into a descending left turn, while Haise pitched the Enterprise to the right. With the Enterprise now flying on its own, Haise made a practice landing flare, to assess the vehicle's handling, then made several control inputs to evaluate the shuttle's response. The Enterprise was flying about eight miles to the right and parallel to lakebed Runway 17. Haise and Fullerton began a gradual 180-degree turn and over North Edwards lined up on the runway. 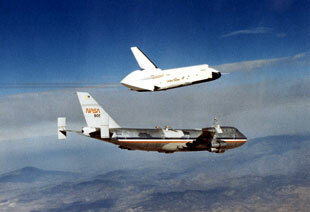 Haise kept the shuttle's speed up to extend the glide and as it neared touchdown it was "high and hot." Haise realized that he was going to land long, and opened the speed brakes to slow the Enterprise. About 900 feet above the ground, he began the landing flare. As the shuttle leveled out, the landing gear was deployed and it settled onto the lakebed at 185 knots. The Enterprise rolled for nearly two miles before stopping. The first flight was a success, descending from 24,100 feet in only five minutes, 21 seconds. Over the next two months another four glide flights were made. Haise and Fullerton alternated with another crew, Joe Engle and Richard Truly, who made the second and fourth flights. The glide flights accomplished a number of goals. First, they allowed pilots and engineers to learn how the space shuttle handled during low-speed flight and landing, providing realistic, in-flight simulations of how subsequent orbiters would be flown at the end of an orbital mission. The flights also validated the digital fly-by-wire control system on the shuttle, one of the first such computer controlled vehicles, although that aspect was not without incident. On the fifth and final flight on October 26, 1977, a time-lag problem was discovered in the control system that made it susceptible to pilot-induced oscillation, a potentially dangerous problem during a landing. Using an F-8 aircraft, a software filter was developed to suppress the effect of this time delay before the first orbital shuttle mission. In addition, the Enterprise flights proved crew procedures, the orbiter's subsonic aerodynamics, and the shuttle's ability to make a precision approach and landing on a conventional airport runway, before it was committed to a Mach 25 re-entry from orbit.